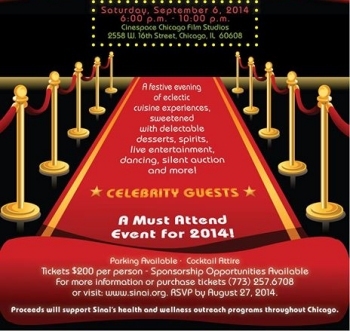 Sinai Health System’s 2014 End of Summer Soirée features an evening at Cinespace Chicago Film Studios, offering eclectic cuisine, spirits, live entertainment, dancing, a silent auction and more. The event will take place on two empty soundstages at Cinespace Chicago –the largest U.S. film studio outside Hollywood –which has hosted production of major films and television shows, including Transformers 3&4, Divergent, Chicago Fire, Chicago PD, Boss, and Mind Games. Proceeds from the Soirée will benefit Sinai Health System’s wellness outreach programs, improving the health of the individuals and communities it serves on the west and southwest sides of Chicago. The Soirée will take place Saturday, Sept. 6th from 6p.m., to 10p.m., at Cinespace Chicago Film Studios, 2558 W. 16th St. Tickets are $200 per person and can be purchased https://5609.thankyou4caring.org/pages/cinespace-event-registration-form.